Do you manage, lead or work with a person who is diligent, looks for collective input and prefers harmony? Do they tend to go quiet during tension? You are probably working with an Amiable. 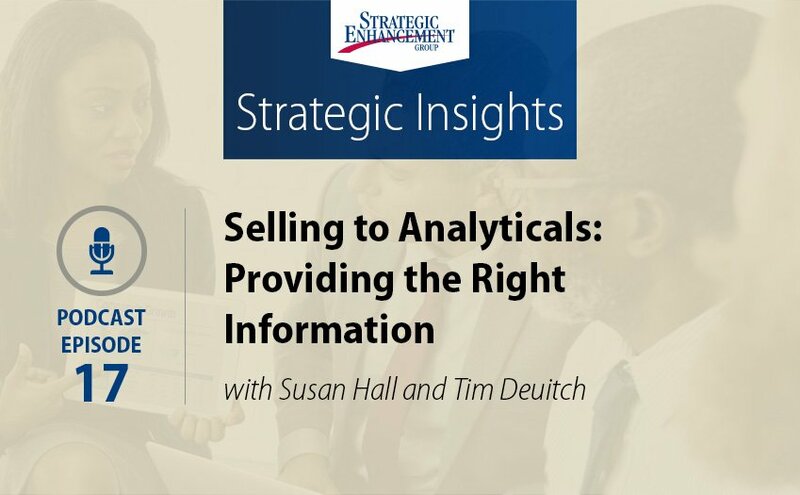 In Episode 16 of Strategic Insights, Tim Deuitch and Susan Hall share strategies for identifying, working and leading Amiables for improved performance through increasing your Versatility. Tim Deuitch: 00:01 Well, hello and welcome to the Strategic Insights Podcast brought to you by Strategic Enhancement Group. 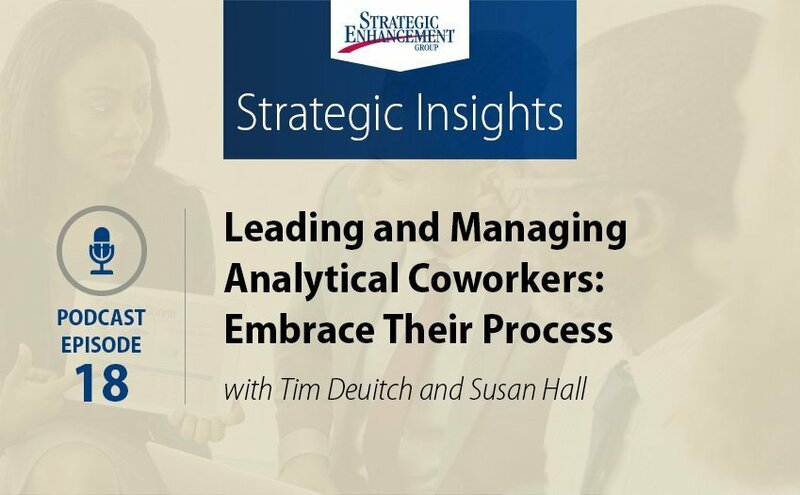 I'm Tim Deuitch, Senior Performance Consultant, at Strategic Enhancement Group, and today I'm joined by Susan Hall, Vice President Business Development & Performance Improvement. Welcome, Susan. Susan Hall: 00:22 Hi Tim, great to be here. Tim Deuitch: 00:27 Now today's podcast is one of a series that addresses the challenges we feel when we work with clients and coworkers that exhibit unique communication styles. Now, during these podcasts, there are four different styles we'll speak to, and I'll describe them briefly. There's the Analytical style, that's a task focused person whose deliberate and thoughtful, and they love process. There's the Expressive person, that's a people focused person who's very verbal. They love to think out loud, and they're creative and demonstrative. There's the Amiable style and that's today's focus. They're people focused as well, and they're diligent, they prefer harmony and collective input. Then there's the Driver. That Driver is a task and results oriented person, who loves to get to the point and use their time wisely. Now, each of these podcasts will address one of these styles. And today our focus is going to be on the Amiable coworker, the person we work with on a day to day basis, who has the Amiable style. 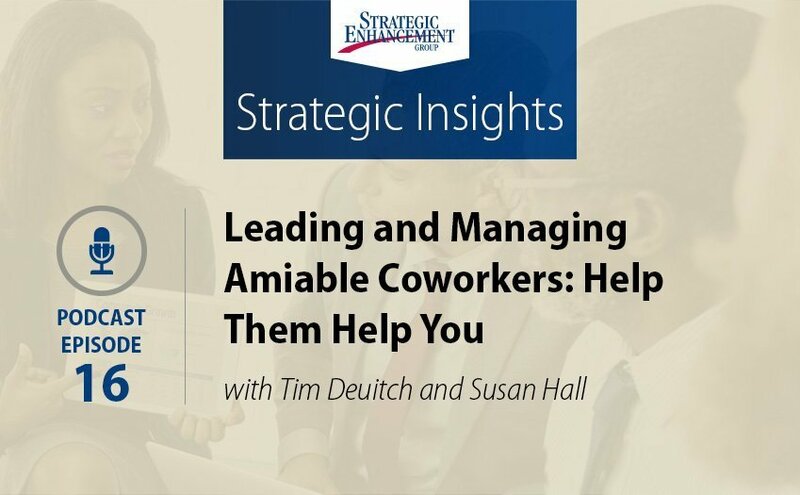 So what we'd like to do, is start with the characteristics of the Amiable style, and then share practical tips and action steps to make the most of your relationship with the amiable coworker, and ensure it is as productive as possible for both of you. So let's start with characteristics. Amiables are people focused. They place great emphasis on ensuring that everyone is on the same page and that everyone's input is considered before decisions are made. In the context of business meetings, they want to make sure everyone is invited and has the chance to weigh in. They tend to be indirect in communication and they ask questions as a way to influence people. They rarely use declarative statements. If they want to press a point, it's usually in the form of a gentle question, versus a declarative statement. This is a coworker that values harmony and positive morale across the organization. Physically, they can be gentle in voice and tone, and often very quiet listeners. They allow others to take the lead and they may become quiet during tense moments or conversations, especially at times when you'd like them to weigh in. So, there's an overview of characteristics. Susan, what are some of the other behavioral cues you see when you're working with an Amiable coworker? Susan Hall: 03:00 I found that Amiables value having people ask their opinions, but they don't necessarily jump right in or dive right in. So, you may need to invite them into the conversation. They may tend to kind of sit back and listen, that doesn't mean that they don't have a valuable perspective to add to the team. They tend to be low-key, friendly, moderately paced, and they prefer to work with colleagues who are of the same, not too frenetic or frantic like some of the styles are, and not too methodical either, as some of the styles are, kind of a nice moderate pace. I found too, that Amiables tend to shut down or go quiet under tension, or when confronted. It's important to approach them in a more subtle, gentle manner, especially if there's a difficult topic that you want to broach. Tim Deuitch: 04:03 Right. With respect to all of the above, one of the things I appreciate most about an Amiable coworker is their sensitivity to the full dynamics of a situation or a decision that might be being made internally. They're mindful of the effect on people in a way that a style that someone exhibits, that might be a fast moving or a bottom line leader, the bottom line leader might miss the effect on people, of a decision, or even just the nature of a dialogue taking place. I like the ability to kind of look at an amiable coworker and gauge how things are landing. They filter decisions or dialogue through the lens of comfort and harmony, and that's not always convenient in a business. It's always important to consider because ultimately, harmony is going to weigh in heavily on collective buy in. Susan Hall: 05:08 Exactly, and how well things get implemented, definitely. I think that they can definitely, I agree Tim, be more sensitive than other styles of colleagues. They can sometimes be railroaded by some of the more tell assertive styles. It's really important with Amiables, to make sure that you're not interrupting, that you're inviting their opinions, and I also appreciate the Amiables innate ability to focus on stakeholders. Sometimes other styles miss this, and then you end up going back and doing more work and positioning after the fact. When really getting their input and perspective upfront would have made the whole process go more efficiently in the long run. Tim Deuitch: 05:56 Yes, I absolutely agree. Let's take time, let's shift it to the typical frustrations or challenges we have with an Amiable coworker. All styles bring points of tension and despite a pension for harmony, Amiables are no different. For me, managers often have to make unpopular decisions and we can't always make things work for everybody. This often means that an Amiable coworker, they're the last to buy in to a decision that won't work for all involved. Feelings versus facts are paramount to them. We often want them to be more pragmatic. 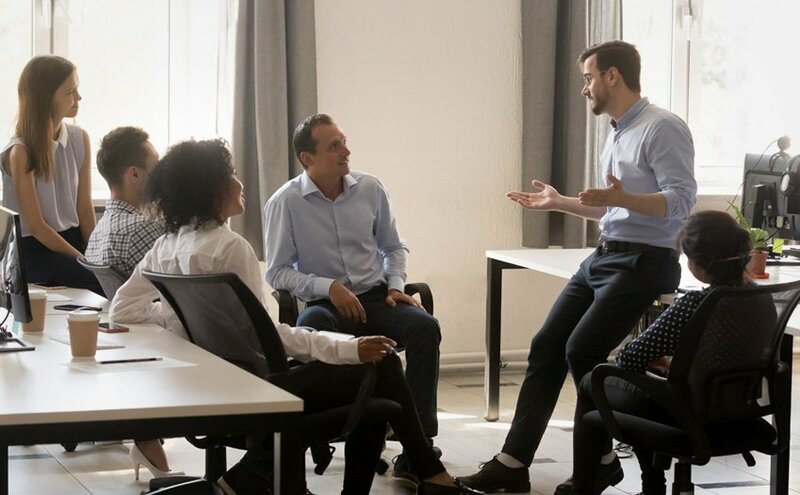 Managers look at the Amiable saying, "Please, face the facts," when in fact, they're often facing the feelings of the situation. Susan, what are some of the frustrations you've experienced with an Amiable cohort? Susan Hall: 07:03 It can be sometimes frustrating to the other styles if you need to get an independent decision from them. 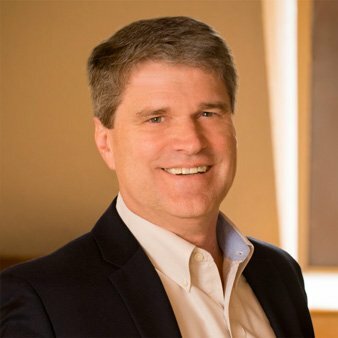 The whole decision making process can feel drawn out to some of the faster pace tell assertive styles, and you may end up having multiple meetings with them and other stakeholders because Amiables tend to be cautious, and they want input from others before making a decision, and that can feel frustrating sometimes. It's sometimes hard to get an opinion. You may have to have a conversation offline, just make sure that you're authentically listening. They may not be direct with you if there's a problem, but again, that doesn't mean that problem goes away. It's just they're not being direct with it. So, just because there's silence, don't assume that you have commitment, check it. Tim Deuitch: 07:58 Absolutely. We start to move towards the tips part of our dialogue. One thing is for sure, we have to recognize when working with an Amiable coworker that they can take more time then task oriented people to buy in. The dynamics of taking that time, is them assessing and understanding the harmony dynamic, and understanding how this will land. If we respect that as a manager, or a coworker, and we look at them and we honor the fact that they have to digest it that way, things will move along quicker, but we have to take it. A few more specific tips when working with an Amiable coworker. First of all, a comfortable coworker is the most productive. This begins with consistently, not incessantly, but just consistently asking about their wellbeing. They value small talk. It matters to them that you really want to know how they are, how they're doing that day, and then conversely, give them space. By this we mean, the space to process decisions or situations. We don't want to ask them to take a hard position or a vote, especially when they're just hearing about something. They're conflict-averse, so avoid putting them in an ultimatum position. It'll make them uncomfortable, as you mentioned before, Susan, they'll likely just acquiesce. They'll say, "Oh, okay, sure," because that's the safest route at that moment. You get a much stronger sense from them, if you give them the time, and then ask them to come and tell you what they think. Relating, giving them advance notice, if their thoughts and ideas will be asked, is appreciated by them, and it gives them the chance to think about some things before they even come to a meeting or a particular moment. Susan, what other thoughts would you put into play here, regarding tips? Susan Hall: 10:17 Well, words are important, that's how we communicate, or a big part of how we communicate. Amiables are comfortable with words like support, team, help, appreciation, value, reputation, feelings. You should be very comfortable asking an Amiable, "Well, how do you feel about this?" or, "How do you really feel about this?" Those words are critical. Give them the attention that they need to feel comfortable with you as a person and recognize that they appreciate a relaxed and low-stress workplace. Keeping your tone, your voice, your pace, as easy going and relaxed as possible, I think is very important. As a manager, tap into their insights, they may not step up directly, but they have ideas and opinions, just like all of the styles. It will be important to make sure that you're inviting them into the conversation, "Bob, what do you think about that?" "Jan, what are your thoughts? You've been quiet so far, but I can see you thinking, how do you feel about that, what do you think?" They will often share the pulse of the workplace, they're really good at that. It's a good idea to ask Nameable, "Well, how do you think this is landing with the rest of the organization?" Tim Deuitch: 11:46 Moving forward, with every style, there are misconceptions about them, and it's no different with the Amiable coworker. From a cautionary perspective, what I would suggest is the largest misconception, is that Amiables can sometimes appear to buy into something. We've touched on this a little bit, but I think it's worthy of going deeper. They appeared to buy in to things when they're not fully committed, and this is because they avoid conflict. It's not because of some other outlandish thought process they have. It's just easier for them to say, "Sounds good to me." So the misconception is, which is what I would say to a manager, is that silence from an Amiable is not buy in. It doesn't mean the opposite every time, but you have to take the time to check in. Ultimate buy in from Amiable coworkers comes at the end of a process, after everybody has weighed in, when they can get a sense of how this will land. That's when you ask them to share what their feelings are, "What do you think about this, what do you think the implications would be going forward?" So you need to take the time to personally confirm their comfort, and then ask them for their commitment, but it's often best asked at the end of a dialogue, as opposed to the beginning. Susan Hall: 13:22 Yes, I would say one of the misconceptions is that for Amiables, relationships are more important than results. The truth is that both are equally as important to Amiables, it's just that they get results through their relationships. The truth is that they want to help the organization succeed, they believe that team member commitment through involvement and harmony is essential to success, that's why that's such a priority. The relationships are such a priority to them in order to get the task at hand done. I've also seen Amiables I've worked with have this wonderful ability to amass a wide range of information and perspectives due to their relationships, and I think that's under appreciated sometimes. Tim Deuitch: 14:09 Yes, I completely agree. Absolutely, that's fantastic insight. We've covered a lot of ground in a very short period and I'd like to summarize real quickly. The Amiable coworker is a people focused style, they highly value collective input and involvement in a supportive work environment. They work hard, and they want to be appreciated for their accomplishments, however big or small they are. They can be very loyal, especially as they establish relationships with coworkers and managers, and these relationships are best formed by recognition of what they bring to the table, the contributions to the work, and them as people. Help them help you by being consistently aware of how they're digesting decisions and situations. In short, if you check in on the wellbeing of an Amiable coworker, they will check in on yours. Susan and I thank you for listening today and we invite you to keep the conversation going with your questions and thoughts, so you can weigh in and learn more at StrategicEnhancement.com. Download to listen on the go and please do not forget to rate us on iTunes. Let us know what you think and please feel free to share!